HF: There is a great deal out there about Diana Cameras but almost nothing on where they were made apart from at Great Wall Plastics Factory, Kowloon Bay starting in 1955. Or ironically photographs of the factory, production, workers etc. Can you tell us more about Great Wall Plastics Factory and the manufacturing of Holga Cameras in Hong Kong? During the 1960’s and 70’s there were several companies manufacturing cameras and binoculars in Hong Kong. Perhaps the most well-known was W. Haking Enterprises, founded by Dr Hanking Wong and Dr Paulina Chan who combined their names to form the brand name Halina. Several of these cameras can be seen in the Hong Kong Museum of History. Here, however, I am going to briefly mention the Diana brand made by the ‘Great Wall Plastic Factory’ which was established in 1955 in Hong Kong. The cameras were manufactured in Kowloon Bay. 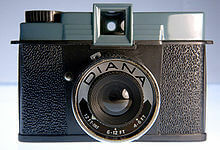 The Diana first appeared in the early 60s as a very inexpensive box camera. There was also the Diana F with a built-in flash. Essentially a toy it was made entirely of plastic including the lens. Quality control was lacking and they were considered to be primitive in the extreme. They had ill-fitting housing, images were often slightly blurred with vignetting and light leaks. The majority were exported to the US and the UK. The Diana was imported into the former by the ‘Power Sales Company’ of Willow Grove, Pennsylvania. In the 60s PSC wholesaled by the case, 144 cameras at about 50 US cents per camera. Even 50 years ago that was very cheap and most Diana cameras were given away or sold at nominal sums as novelties or prizes at fairs, product promotions or at raffles. For a time the camera was also regularly advertised for sale in periodicals through mail order vendors. 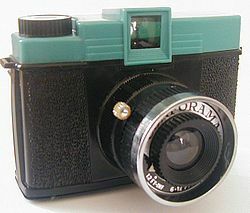 However the development of cheap, higher quality cameras such as the Kodak Instamatic led to a decline in demand for the Diana, even as gift. Production of the Diana stopped in the 1970s. While considered a failure at the time, some photographers relish the Diana’s soft, unpredictable and dream-like images and it has taken on something of a cult status . As a result an original Diana in good condition can sell for “premium collector dollars”.